This is the second time I have run in this race. 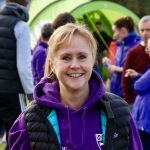 The first time was back in 2010 when to be honest I didn’t do much running but one of my close friends Emma Johnson, Ann’s daughter encouraged me to take part. My memories of that day were lots of mud, ruined trainers and painful legs! That day I completed the race in 57.11. So I was hoping to do a bit better this year! Race day was beautiful and you would think this meant perfect running conditions but no the order of the day was MUD and lots of it!!! I stupidly thought it couldn’t be muddier than last week at X Country. Of course I chose to wear my brand new sparkling clean trail shoes for the occasion much to the amusement of others! Let’s just say they needed a good shower when they got home! Yet again Striders were out in strength with 15 of us taking part. Before the race started there were the customary pre-race photos then onto the start line we went. Before the race began there was instructions about the route, followed by a few words from Barry Johnson, Ann’s husband. Today was made more poignant in that it was the 6th Anniversary of Ann’s death. A minutes silence was then held. The start of race was part way up a hill (this year the race start was brought forward to make it up to the 5mile mark), which quickly led to a very muddy field. 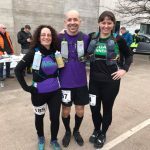 Initially I tried to dodge the puddles and mud but soon realised that this was just the start of a very muddy course, and if I stayed upright I was going to be very lucky! My lovely trail shoes were very quickly clogged up with mud and grass. Following a period on very sludgy grass there was a period on a dry ish trail which was a welcome respite from mud. However this did not last long and we were soon trudging through mud again which lasted almost the rest of the course. Towards the end of the course there was the dreaded hill! I attempted to run up the hill but soon discovered as soon as I took a step forward I was sliding back down. In the end I gave up and walked up the worse part until I came up to a bit where I could grip onto. It was a relief to get to the top until I realised that what comes up must come down! 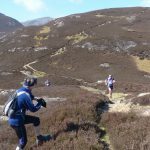 I watched a few runners go down in front of me then took the plunge myself expecting to most probably end up at the bottom on my backside! Luckily I got down the hill unscathed and it was onto to the last part of the race which thankfully was on gravel. 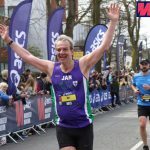 As I came towards the finish line I was greeted with shouts of encouragement from fellow striders who had already finished which helped me muster up a bit of energy for a sprint finish! I quickly joined some of the other striders to shout the rest of our guy’s home. Once the last strider was home it was time for the well earned goodie bag of the much promised mars bar and PINK t-shirt! Graeme Walton was first strider home, quickly followed by Jon Steed. Katy Walton was first female strider home but most impressively crossing the finish line as third lady finisher! Well done Katy you did us proud! Kirsty Anderson was second lady strider home, matching the position of her soon to be husband! The rest of us followed in with very respectable times given the tough conditions. 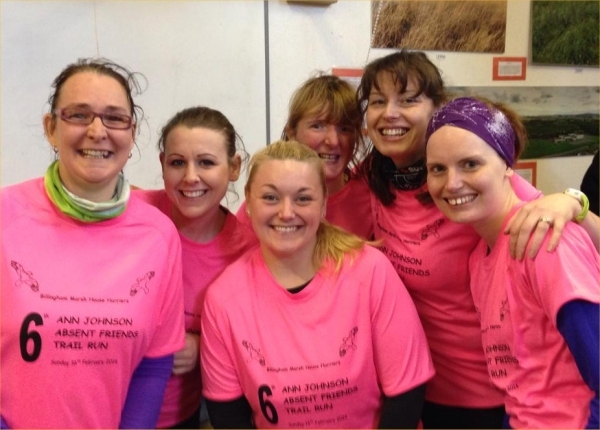 A special mention also goes to the ladies completing their first 5mile race today – you did brilliantly and should feel very proud!